Environment, (MDE) and the Office of the Attorney General related to alleged agricultural compliance violations of a conservation easement along a Brook Trout tributary of the Gunpowder. Gave testimony before the Sport Fish Advisory Commission and asked the Maryland Park Service to regulate recreational tubing and enforce no alcohol laws throughout Gunpowder State Park to address community concerns about public safety and habit degradation. Formally asked MDE to reopen a federal discharge permit and provided comments with the Environmental Integrity Project that asked for a reduction in the discharge of heavy metals from a coal fired power plant located along the Lower Gunpowder River. Coldwater Summit at the USFWS NCTC in Shepardstown, WV. 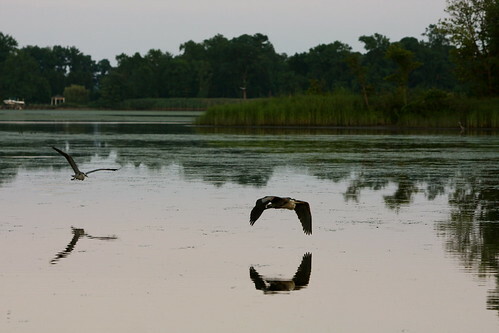 Commented on a Water Quality Assessment of the Lower Gunpowder River and asked MDE to include a compliance record of waste water treatment plants that discharge into the Lower Gunpowder River to better typify the water body prior to reclassification and removal from the 303(d) impaired waters list. Attended Regional, (Baltimore, Harford and Carroll County) Watershed Implementation Plan and Total Maximum Daily Load meetings to discuss implementation of the EPA’s Chesapeake Bay Pollution Diet. Regulations and asked the Department to strengthen regulations to protect water quality in streams along and downstream of construction sites. phosphorous in residential lawn fertilizers sold in Maryland in 2012. Sampled the watershed with 13 volunteers for MDDNR Stream Waders Program. Hosted an American Rivers Gunpowder River wide cleanup. Recruited volunteers and took part in a stream planting project to stabilize the Little Falls, an important tributary of the River. Atlantic Council Trout Unlimited’s Elliot Donnelly Award. Gunpowder RIVERKEEPER® is recognized by the IRS as a 501 c(3) non-profit classified under natural resource conservation and protection and your charitable contribution is tax deductible to the fullest extent of the law. If you feel that the work of Gunpowder RIVERKEEPER® described above has value, please consider an end of the year donation and become a member to further the cause of protecting the Gunpowder River for future generations. This entry was posted in news on December 30, 2011 by Theaux Le Gardeur. 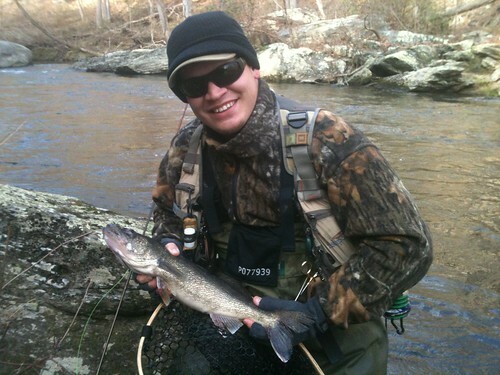 Lefty Kreh with his namesake Deceiver is featured on the 2012 Maryland Fishing Guide. 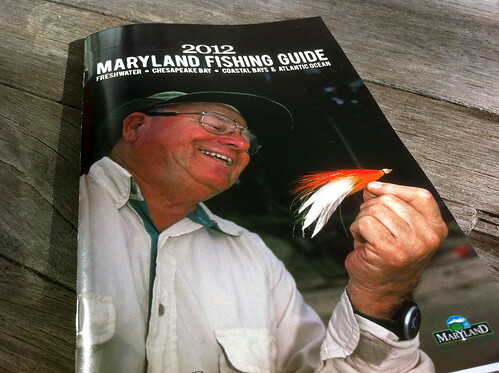 Get a copy of the guide when you pick up your 2012 Maryland Fishing License. Please be sure to bring your drivers license and check or cash for the license payment. 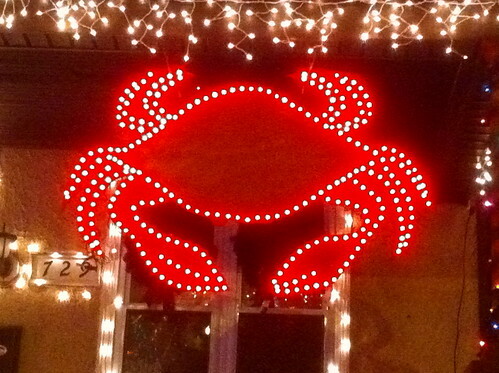 Note: The shop will be open this Saturday till 4:00 PM and will be closed on New Years day. This entry was posted in news on December 29, 2011 by Theaux Le Gardeur. The river is clear, flowing at 264 CF dropping from the mid-300’s.Water temps are cooling down to 46.5 F. Bees are still crawling and the grass is still growing along the Gunpowder. Folks are still fishing flats and backeddies with olives. In higher flows, nymphing with brassies, zebra midges and tiny pheasant tails is most effective with leaders over 10 feet. Swinging streamers over the gravel with a sink-tip is also worth a shot. The grass is still growing along the river. This weekend, the TV can wait and lord knows your help in the kitchen won’t be appreciated. The fishing will be tough but remember that you are far less likely to catch a glimpse of a bald eagle, river otter or wild fish in a mall parking lot. This entry was posted in fishing report on December 24, 2011 by Theaux Le Gardeur. 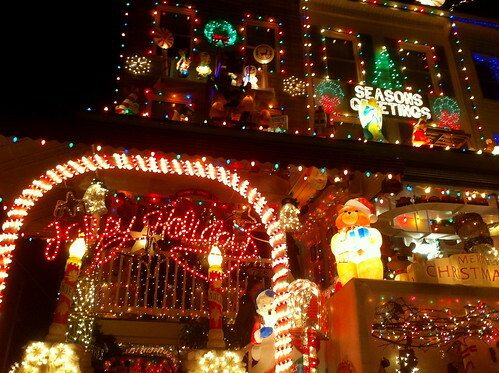 The miracle on 34th St in Hampden properly rings in the season. This entry was posted in news on December 24, 2011 by Theaux Le Gardeur. In all my ten plus years fishing this gem I’ve never had a day like this! I worked my way up from the bridge at Falls Rd practicing my euro nymphing skills, I pulled a few fish out of the deeper seams as I fished up stream. I got up towards the big rock that blocks the river up from the bridge and started working the deep hole, I detected a strike and set the hook and the fight was on. My three wt was screeming and I saw the tail of the fish and realized I had a 20″ plus fish on. As I finally tired this brute out I noticed that it wasn’t a rainbow as I suspected but instead a walleye. Yes a walleye, I figure it had to get past the dam and get down here with all this rain we had! This 22″ fish decided to chow down on my egg pattern, I was totally amazed as were the staff of Backwater Angler! Thanks Backwater for being my fly shop! This entry was posted in news on December 22, 2011 by Theaux Le Gardeur. 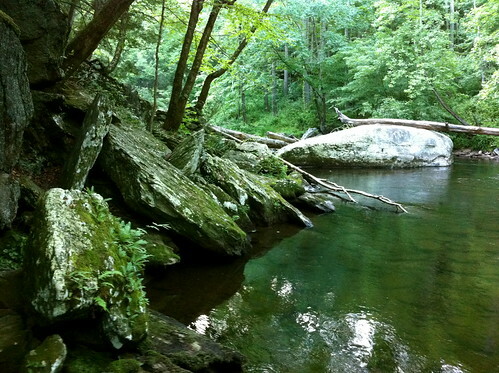 This winding, tree-shaded trail-previously called the Gunpowder South Trail-Follows the Big Gunpowder Falls River, a blue ribbon trout stream that serves as a right of passage for anyone getting into fly fishing in Maryland. Congrats Lefty, you’re an inspiration to us all! This entry was posted in news on December 21, 2011 by Theaux Le Gardeur. Round up some holiday stationary, give us a call before noon on December 24th and print out our fly fishing gift certificate at home. We can also send one priority mail with delivery confirmation by December 20 or stop by the shop prior to Christmas and pick up one for your loved ones. Gift Certificates are available in any denomination and can be used for fly fishing gear, fly fishing schools or guide trips. Flies, while not included are great stocking stuffers! 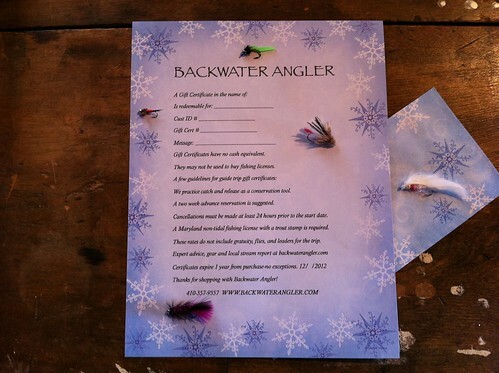 Point your gift givers with a Mastercard or VISA to the Backwater Angler Gift Certificates Page. Pick up a certificate for Gear from $25 and up! 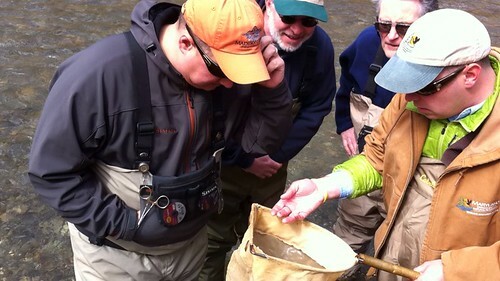 Certificates for Fly Fishing Schools are $100 per person. 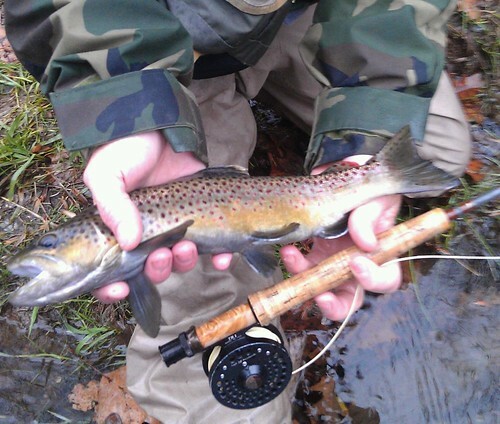 Spend a half or full day Fly Fishing the Gunpowder with a Backwater Angler Guide $225 to $325. Remember that Backwater Angler gift certificates can be mailed or emailed in a flash without subjecting your loved ones to beltway angst. Thanks for shopping where you get your stream report! This entry was posted in news, Shop Online on December 19, 2011 by Theaux Le Gardeur. Thanks to Kevin for sending in a stream report and wishes of holiday cheer! Just wanted to say thanks for the info regarding the Gunpowder. Chick and I hit the sections you suggested from dam down to the bridge at Big Falls Road over the day and ½ we had to fish. Friday (upper section Masemore Rd to the Dam) was much more productive than Sat (York to Big Falls Rd). We landed a mix of Browns and Bows on Friday but had only two small Browns on Sat. Water looked perfect but we either missed the timing, set up or they just were not interested. We struggled to even spot many fish in the lower section. We wanted to make a stop at the shop and thank you in person before we left on Sat but time got away from us and we had to hit the road back home. Looking forward to seeing you again and spending more time exploring the river. Thanks again and have a wonderful Holiday. This entry was posted in fishing report on December 19, 2011 by Theaux Le Gardeur. Hey Theaux – Good to see you yesterday. Got a chance to get out today and for the first time, took two strung rods with me. 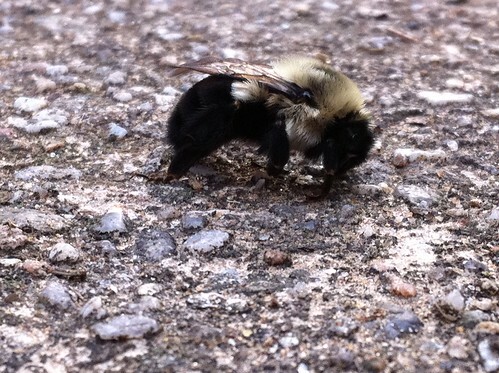 Carried one broken down on the backpack. Streamer on one and snowshoe bwo from the shop on the other. Had several nice 11″+ fish on the streamer and a handful of smaller fish on the olive. Even had a visit from a bald eagle. He perched up high about 30 yds away and hung around for about 30 minutes. An awesome day on the river. 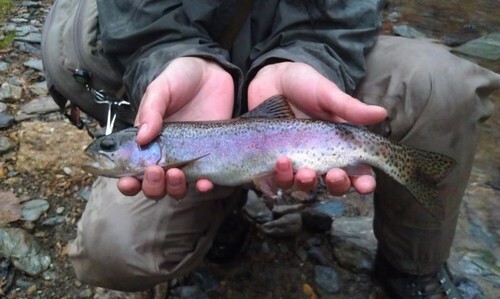 This entry was posted in fishing report on December 16, 2011 by Theaux Le Gardeur. 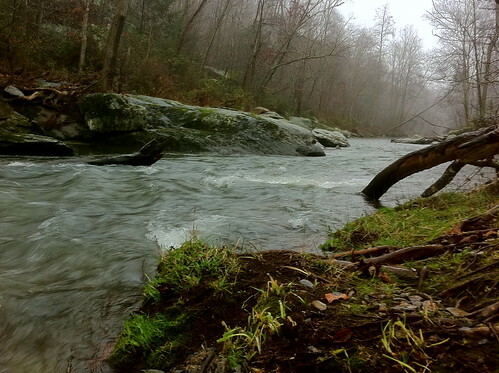 The Gunpowder River is 49.5 F and is coming down from 336 Cfs today. This bright rainbow, released by Megan Lewatowski fell for a BWO nymph as the river was quieting down and flowing in the mid 200’s. 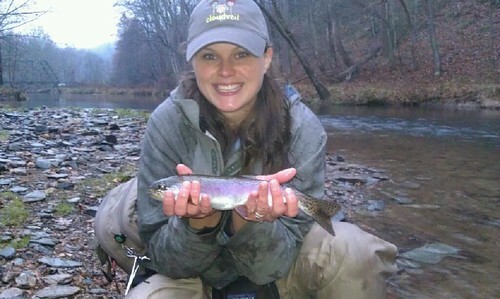 Last weekend we had several reports that fish were moving on streamers. Blue Winged Olives were coming off and fish were taking snowshoe rabbit patterns in the flat water and pools. With more rain and a dusting of snow midweek the river started acting like a freestone again, moving up from 2.32 Ft and 196 CFs to 4.03 Ft and 665 Cfs. If you’re heading out this weekend leave the three weight in the truck, be sure to bring a wading staff and plan on fishing a five or six weight. The river has been clearing all week as the reservoir just turned over. Fishing streamers with a sink-tip line or Airflo sinking Polyleader might be in order, will be a lot easier to cast than a streamer with three BB shot and will allow the fly to drift rather than swing. With a few warm days ahead of us anglers interested in fishing through the afternoons this weekend should connect in the back eddies and flat water with Mike Bachkosky’s BWO unusuals and “Phunny” emergers from the muffin tins. Longer leaders are a must when the water is up-so try a 12ft 6x with the dries and emergers to allow for better drifts over fish that are holding behind woody debris and along shallow edges. This entry was posted in fishing report on December 9, 2011 by Theaux Le Gardeur.